Corporate events. It's what we do. All kinds of music for all kinds of people. Corporate events are different than any other and they require a band that knows how to work the crowd. 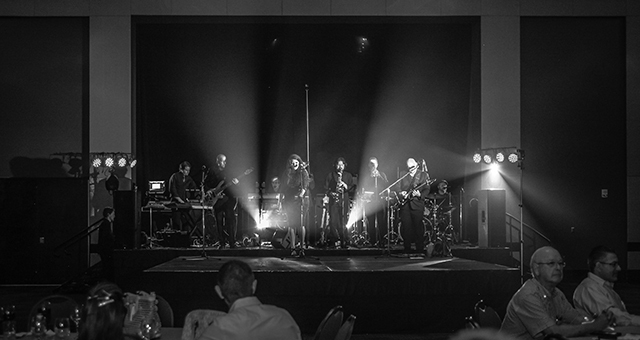 Band of Gold provides the excitement and the energy your event needs to keep your employees entertained. Band of Gold wants to know your employee demographics so we can come prepared to perform all of your staff's favorites. We want to know the ages and ethnicity of your group but even more than that, we welcome you to get a list of songs requests from your employees so we can fully engage the audience. Band of Gold is also very accomodating to the specific needs of your event. Want a microphone for your CEO to make announcements or for Human Resources to pass out awards? No sweat! Your company can use all of our sound and lighting equipment at your discretion. Band of Gold can also lead your group in team participation or ice breaking events. Wow! Thank you Band of Gold for performing our team banquet! You played the right music at the right time and even had our CEO shaking it on the dance floor. We will definitely have you back again and again! Don't know what to do for your company get together? We have tons of options from costumed decades parties to group participation games. Atlanta Band of Gold can perform hours of music from any decade. Themed parties are all the rage at corporate events. We even have a "Decades" show highlighting the history of music from the 1960's to today! Want something memorable for your employee appreciation event? Check out our super popular theme show celebrating the music of 1955-1965, "Shama Lama Live!" Your guests will dance and sing the night away while Band of Gold plays 1 and 1/2 hours of Rock and Roll classics like The Temptations, Chubby Checker, The Drifters, The Coasters, Elvis Presley and many, many more! Check out SHAMALAMALIVE.COM for pictures, videos, and music! We don't just perform corporate parties! Weddings, charity fundraisers, community festivals, private parties. We do it all!